Happy New Year, may the next 43 years until the 250th BOLE anniversary begins be prosperous and meaningful for you and your family. I wanted to thank everyone that supported the broad and noble effort to observe the bicentennial of The Battle of Lake Erie. I enjoyed writing stories that celebrated so many of the people, places and organizations that made this three year observance so successful. The next 43 years should lead us to an even bigger celebration in 2063. I plan to be there, at least in spirit. Thank you. Join us for the Final Events in the three-year observance of the War of 1812 and the Battle of Lake Erie. Join us for a day to remember. Tickets for the day are a donation to the Perry Group and include passage aboard the Miller Ferry to the battle site, coffee and light breakfast and the reception at the Keys with hors d’oeuvres and a drink. 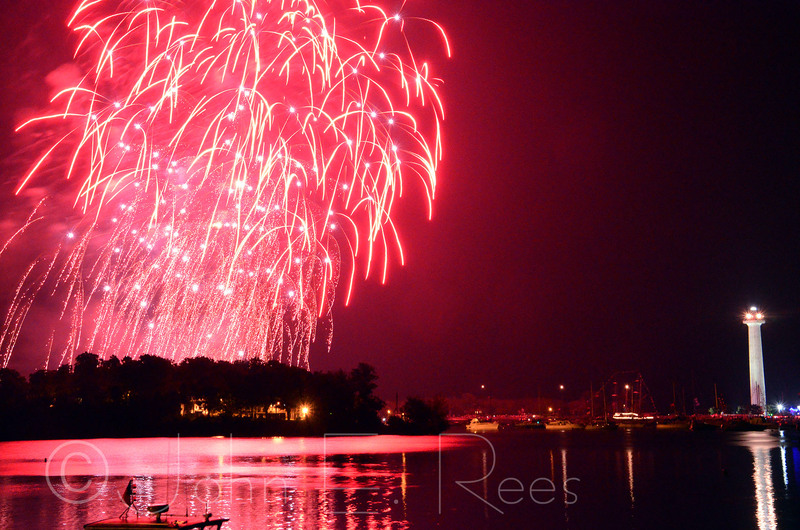 $35 per person, $25 for Perry Group Members. At Dusk (9ish) *Lights of Peace—Harbor Illumination sponsored by the Perry Group. Flares will be lit around South Bass Island in memory of friends & loved ones. 10 a.m. Procession: In Remembrance of the Fallen (20 minute ceremony) Participants need to arrive NLT 9:45 a.m. to line up. I was recently sent an article by Boston Globe Writer Tom Halsted entitled “The real shameful story behind ‘Dont give up the ship’!”, about the iconic American slogan that is attributed to Captain James Lawrence. His recounting of that fateful June 1st day casts an ugly shadow on Lawrence, Perry’s hero, albeit not the resulting slogan that emerged. While it was a terrible Naval/military loss—Halsted’s article puts forward the idea that is was a PR win for the US. I might add that from that perspective is was perhaps the most important propaganda message to emerge from the early part of the War of 1812. But he quickly goes on to paint a much bleaker picture. The events that day, according to Mr. Halsted were a combination of James Lawrence not following orders, bad decision making, poor strategy and a lack of crew training. Some say that Captain Lawrence was goaded into battle by bold editorials whipping up local fervor in local newspapers, patriotic crowds standing watch and an early over confidence among American leaders and the military. It was just a year into the war and the British were still pretty preoccupied with Napoleon and the French. American privateers, and the USS Constitution had all been quite able to defeat and or outwit many of the British ships. So why not think Captain Lawrence could defeat the British. He had been a stand out leader and had led his past commands with valor and success. A young OH Perry had been aboard with Lawrence and valued his expertise and good judgment. There was no reason to think that this would be a devastating loss. According to Mr. Halsted, in late May 1813, Captain Philip Broke sailed the HMS Shannon, flagship of the blockading British squadron, into Massachusetts Bay alone, knowing the Americans had only one frigate ready for sea in Boston. On June 1, the Chesapeake rose to the challenge. Unlike most sea battles, which take place far from land, the whole encounter was staged for public viewing. “Spectators lined the rooftops in Boston and along the North Shore, and commanders of both ships repeatedly had to warn a boisterous spectator fleet of yachts and small boats to stay clear,” wrote Halsted. The battle commenced, Lawrence not only put his ship in harms way, pulling aside HMS Shannon but he loses the battle in a record 11 minutes. There was tremendous carnage and casualties on both sides with nearly 40 dead on the USS Chesapeake and 34 on the British ship HMS Shannon. The worst of it was that according to Mr. Halstead’s account Captain Lawrence was mortally wounded and taken below to be attended to by the ships surgeon. From there he was unable to command his ship allowing the British to board and seize control. A total disaster at sea with an audience! As Napoleon is credited with saying “What is history but a fable agreed upon?” There is no question that on that day the engagement between the Chesapeake and the Shannon should never have taken place. Halsted observed that not only did Lawrence’s surviving crew give up the ship almost immediately, but some historians believe that Lawrence had disobeyed orders to avoid combat in the first place, then committed a series of tactical blunders that all but guaranteed he and his ship would lose. So what was won that day? We do know that a few months after the battle, a dark blue almost black banner, was commissioned by OH Perry with Lawrence’s words sewn on. It was hoisted to the masthead of his namesake vessel, the Brig USS Lawrence. Its captain, Commandant Oliver Hazard Perry, then won the most decisive victory in the War of 1812 on Sept. 10 over British naval forces in the Battle of Lake Erie. That original “Dont give up the ship” banner now graces the US Naval Academy main hall. So as Winston Churchill once may have said “History is written by the victors”. 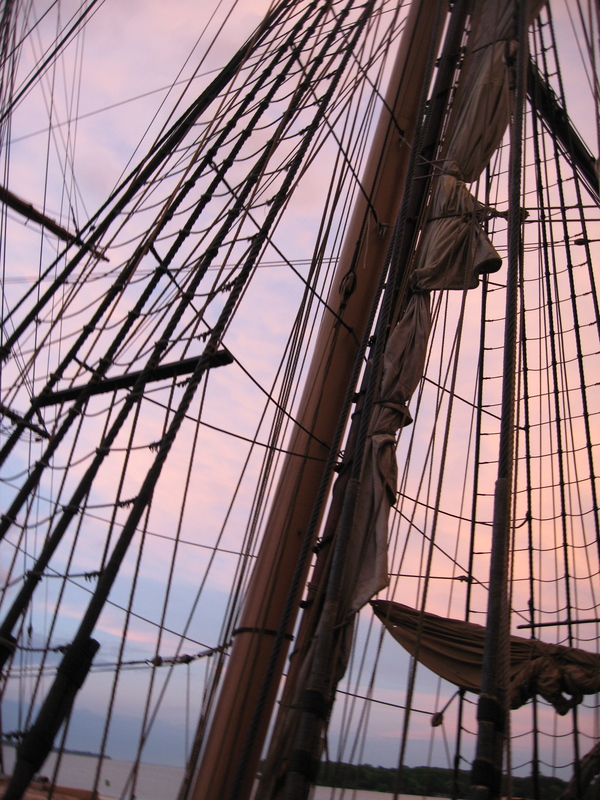 Note: Tom Halsted is a Gloucester Massachusetts writer and sailor and the great great grandson of James Curtis, a midshipman who, as a 15 ­year ­old, was Lawrence’s aide ­de ­camp on the Chesapeake. (https://chasingperry.wordpress.com/2013/07/01/lost-and-waiting-to-be-found-janes-missing-essay/) and this story only gets more unfortunate as I learn more about the essay contest. This was a well-publicized contest that was competed at both county and statewide levels. There is some evidence that perhaps some form of this essay contest was even done in all the 14 states that were part of the Perry’s Monument Commission. As I investigated further it seems that there probably were winners in every county. And then to make matters worse, there were two submission categories, high school and college! In Ohio alone there are 88 counties, which means there would have been 172 winners and a like number of runners up. The county winners were then submitted to the state for “final” judging. There was conflicting information that said that these winning essay(s) would be placed “in” the Monument, though not necessarily in the time capsule placed in the column wall. The complicating factor was that when the monument was originally designed and built there was supposed to be a museum built where these essays and many other artifacts would have been housed. That museum was never built (see picture). What happened over the next 100 years under the monument plaza were poorly controlled conditions in the chambers where items were stored. Water, humidity and poor storage conditions damaged much of the contents. Sometime in the 80’s prior and during the Monuments major repair for water damage, former NPS employees recall boxes and boxes of ruined “stuff” were hauled away. When that same renovation was being done, the construction workers discovered the time capsule. They removed it the National Park Service logged its contents and placed it back in the wall. No essays were in that time capsule content list unfortunately. When we had the Mason’s here to do the cornerstone ceremony I inquired with them on this story and the contents as well. They had been in charge of the capsule and contents and they had no information on the essay contest winners being included in this box either. After the renovation construction was completed the time capsule was put back in a wall and the capsule’s exact location was not noted. There were no organized efforts to locate it during the bicentennial year again since it had already been opened previously. So sorry to say we did not pursue this missing essay project any further. The hundred or more essay(s) could have been in the boxes of “stuff” removed, or perhaps they could be in some never inventoried box at the Columbus Statehouse Archives or some other county historical society storage facility. I am sorry there is no happy ending to yet for this story. But who knows, maybe the essays will turn up in some archive or family barn. I would hate to think they all rotted away in the storage areas under the plaza of the Monument. I am hopeful that somewhere there is a person who may know of the where about’s of these essays. Nell was able to find a few in the Western Reserve Historical Society. 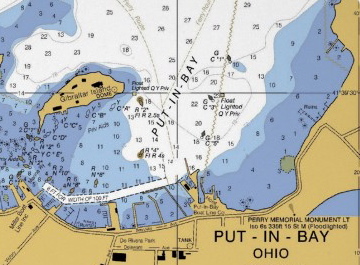 If you have an idea on where we might look, email us at the battleoflakeerie@gmail.com so we can put this mystery to rest! 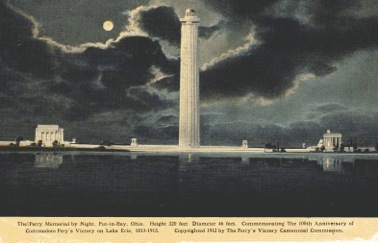 “Friends of Perry’s Victory and International Peace Memorial”, better known as the “Perry Group” is the official National Park Service registered support group for our monument and it’s mission here in Put-in-Bay. Many years ago we were one of the first non-profit groups in Ohio to get a special license plate designed and issued by the Ohio Department of Motor Vehicles. Every time you see a car with the Monument on the plate that person is helping us to provide support to our NPS site here in Put-in-Bay. Over the past 25+ years the Perry Group helped raise funds to build the visitor center, underwrite the Dean Mosher paintings hanging there, secure artifacts, publish Gerard Altoff’s books, and even build “Perry’s Longboat” all with your help. Annually we are often asked to provide support for events, re-enactors, rentals, and music. One of the most delightful parts of our summer is bringing the renowned Toledo Symphony to the island. The Toledo Symphony has recorded and performed with great musicians like Vladimir Ashkenazy, Isaac Stern, Aaron Copland, and Itzhak Perlman, and has even performed at Carnegie Hall in New York City. Last year during our Bicentennial Celebration scheduling precluded us from inviting the full symphony to perform so that the time and attention of historic Saturday’s events could be focused on Park Canada’s amazing “Tattoo” performance. We engaged a small Toledo Symphony ensemble to play after the Tattoo as our Harbor Illumination was being set up. They delivered a beautiful performance. Our regular contact at the Toledo Symphony over the years has been Sandra Clark. Sandra had always made sure that we had the best event possible with top musicians and a great conductor making the journey to the island to play. She asked that when we brought the Symphony back in 2014 that they be able to play once again on the plaza at the monument. This is a wonderful tradition that dates back well over a decade here on Historic Weekend. We have requested this for 2014. Sadly Sandra unexpectedly passed away two weeks ago without being able to return with the Symphony.So that makes this quite a special year for us at the Perry Group as we remember our friend Sandra while presenting the Toledo Symphony once again here at Perry’s Victory. So come help us continue to commemorate the War of 1812. This 200th anniversary year (1814) will be remembered for the noted famous poem “The Defense of Fort McHenry” written by Francis Scott Key. Of course we now know it as “The Star Spangled Banner”.This year the symphony will perform a special concert dedicated to the writing of the poem and celebrating the remembrance of the battle of Fort McHenry in Baltimore that gave us the lyrics to our most cherished anthem. 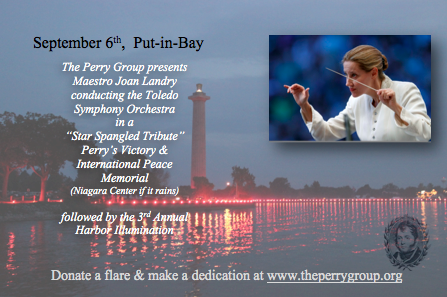 Join us Saturday September 6th at 6pm for the triumphant return of the Toledo Symphony Orchestra and their special tribute to Francis Scott Key and the music that America loves to hear at Perry’s Victory and International Peace Memorial (or at the Niagara Center if it rains). It is hard to believe that the bicentennial has finally arrived. Two hundred years of memories built upon memories of that important day back in 1813. History has guided us to this wonderful moment in time. The 200th Battle of Lake Erie Bicentennial will be filled with vivid new images that will be seen, shared and enjoyed for years to come. Many of the past images we have in our collective conscience are of war ships and battle diagrams, slogans like “Dont give up the ship” but the memories we want to share and promote from here forward are also about the peace we continue to enjoy with Canada and Great Britain. In fact that friendship is the greatest gift we pass on to the next generation from this bloody battle and costly war won by our brave sailors and militia. Over the next two weeks and perhaps for the next few years, we can expect many families and children will come to our island to see where this all took place. If we do our jobs as guides and storytellers well, visitors and parents will pass on this important legacy of peace. Our children will see the Battle of Lake Erie in a positive light, a bicentennial story, without lingering on the bloodshed and horrors of war. Instead lets explain how honor, duty and patriotism made way for a new beginning with our neighbors. 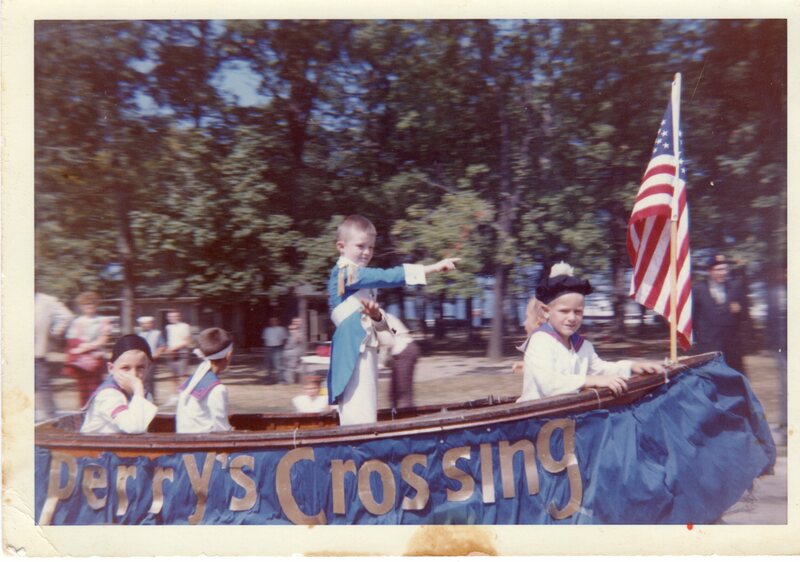 50 years ago our little community of Put-in Bay proudly hosted the Sesquicentennial for the Battle of Lake Erie. I had not really given it much thought, not living here then, but one afternoon I was at a community gathering when Mark Wilhelm, our past Fire Chief, explained to me his recollections of this 150th Sesquicentennial event. He remembered fondly being picked by his teacher to be Commodore Oliver Hazard Perry. He wasn’t sure why he was picked but he still remembers riding on the “Dont give up the ship” float and then getting to do it all over again in Port Clinton a week later. What a thrill that day was. Luckily, his mom had saved some pictures of that event that he shared with me. He certainly looked sharp in his uniform as Commodore Perry aboard the long boat. Miller Boat Line’s Julene Market also remembers this day vividly. If you look closely I think she is in the picture on the float dressed up as a sailor. No doubt this was an important moment in the lives of these island children. 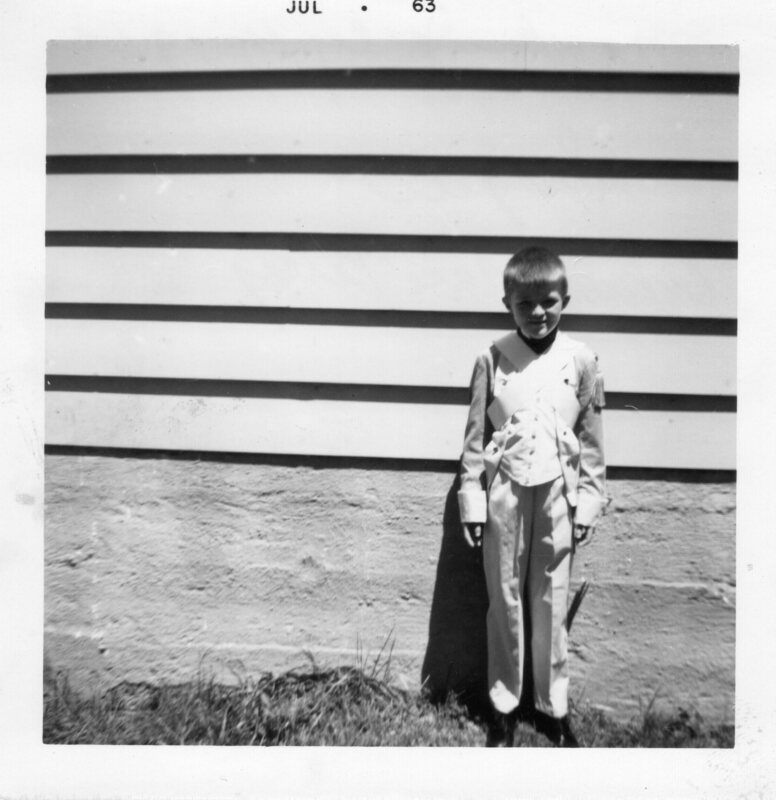 The elementary teachers at Put-in-Bay school helped history to come alive for these children. They learned about Commodore Perry, the Battle of Lake Erie and how our island played such an important role in history. Civically minded islanders like John Ladd organized parades, built floats, and planned events that have remained happy memories. With out the incredible community efforts of 1913 and 1963 we might have lost touch with the deeper meanings of Perry’s Victory. Mark Wilhelm, Julene Market and Jackie Wertenbach share memories that I bet helped shape them as individuals. It makes me happy to know that these former Put-in-Bay school children, who are our now the leaders of our community, dressed up and paraded through the downtown sharing their love of history joyously with the island. These next 12 days I hope you enjoy the many amazing experiences that have been planned and share memories of this once in a lifetime event with your children and grand children. We can shape the future we envision, as we remember forward.